No matter the season, stone fruits are a beloved ingredient in so many delicious baked goods. From pies to pastries, we try our hardest to make fruit, nature’s candy, shine in some of our favorite desserts. But one of the best ways to highlight all their simplicity and rustic goodness is by celebrating their diverse flavors through crisps and crumbles. Beautiful and delicious additions to any menu, these two complementary desserts are the classic sweet treat for that cool, chilly night thanks to their cozy flavors just bursting in every bite. Beloved by many as the must-have dessert, crisps and crumbles offer the comfort of fruit pies but without all the hard work. Best of all, these rustic desserts are not only simple to make, but most only require a baking dish, some fruit, a few ingredients and creativity. Served warm and most often with a scoop of ice cream, we share the must-have fruit crisps and crumbles for every occasion. 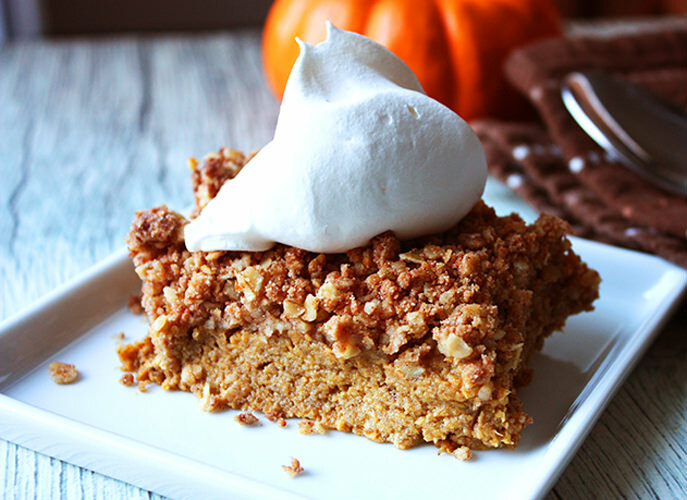 Aim for non-traditional with a pumpkin pie alternative just as delicious, but also happens to be gluten-free and easy for the unconfident baker. Add a dab of whipped cream for a smooth, comforting dessert. 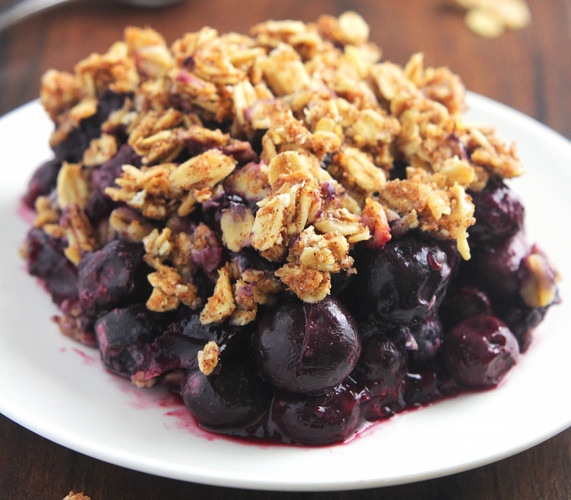 This aromatic and heavenly fruit crisp is the most unique. With an out-of-this-world combination of flavors from the sweet and almost-creamy persimmons to the tangy trio of cranberries, lemon and ginger — it’s a mixture balancing sweet and tart with a buttery, cinnamon vanilla crumble that will have you wanting seconds. Or thirds. For those missing summer and bonfires, this crumble is a decadent transitional cozy recipe that will have everyone mesmerized. With seasonal pears and a sprinkle of sunny memories, when this crumble cools down, the marshmallows get crunchy on the outside but oh-so heavenly gooey on the inside. With a texture similar to apple pie but still upholding all that fruity, crunchy, fall-spiced charm, this nutty, oat-y crumble brings a sweet floral flavor thanks to the cardamom. It’s unlike any other flavor you’ve tried! Adding sophisticated notes of almonds and oats, this sweetly aromatic and vegan-friendly recipe boasts an elegant three-ingredient blueberry filling with a cinnamon-spiced oat streusel topping for an easy, mouthwatering dessert — especially when served with ice cream. 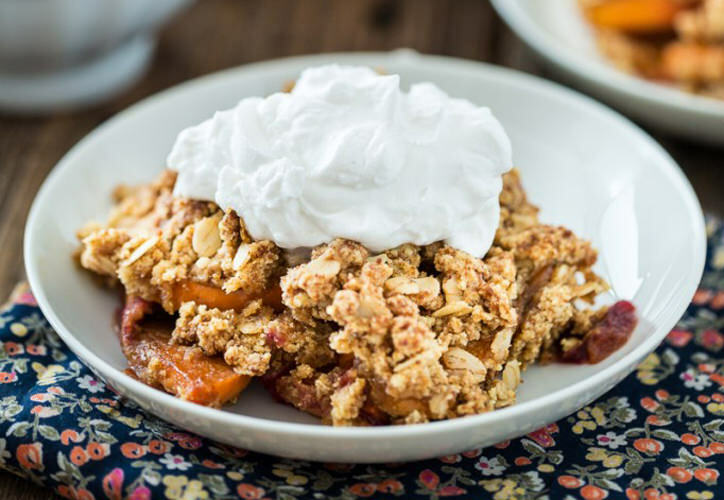 Deemed the ultimate comfort food and layered with juicy fruit in a cast iron skillet, this peach crisp oozes rustic simplicity with its brown butter pecan crumble topping of oats, nuts and cinnamon. Satisfy your dessert-loving stomach with a fruit crisp of blackberries and strawberries topped with a buttery crumble of gingersnaps and oats. Tarty, yet sweet — everyone will love this blend. Best served warm, this crisp fuses sweet and tart for a delectable dessert that is at its best only 263 calories. And with a thick, syrup-like juices complementing an almost cookie-like topping of oats and coconut, this will be a winner at the table or during your next Netflix-binge. Nothing beats the aroma of warm cinnamon apples simmering on a stove. 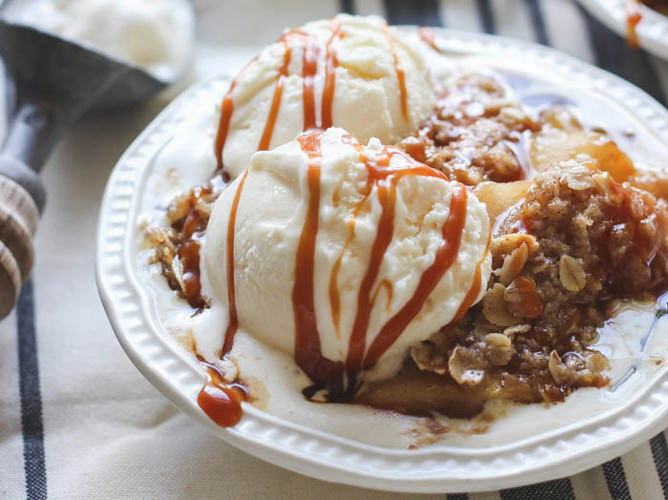 This deliciously scented and drool-worthy crisp takes the classic apple pie to new heights with its salted caramel topping that balances the sweet and tarty apples. These miniature peach crisps are not only pretty and intensely delicious when topped with a bit of ice cream that just melts into each crevice, but the recipe is super easy and each cup is a single-serving size — perfect for festive dining.